Phillip Cate is an artisan from the Red Pheasant Cree Nation and the Pueblo of Santo Domingo. He resides in Albuquerque, New Mexico. He learned how to do bead work from his kokom (grandma) by spending time with her and asking her to teach him the trade. After starting his first beaded pouch, he made many different beaded items. Phillip can bead moccasins, earrings, bolo ties, baby moccasins, as well as a fully beaded regalia. 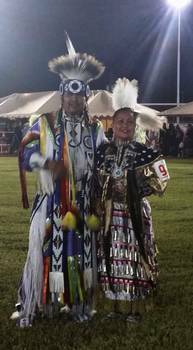 Phillip also sings and dances at powwows and travels throughout the Untied States and Canada.